If you’ve had ice dams, burst frozen pipes, and/or frost heaves year after year at wintertime, you likely have foundation problems. 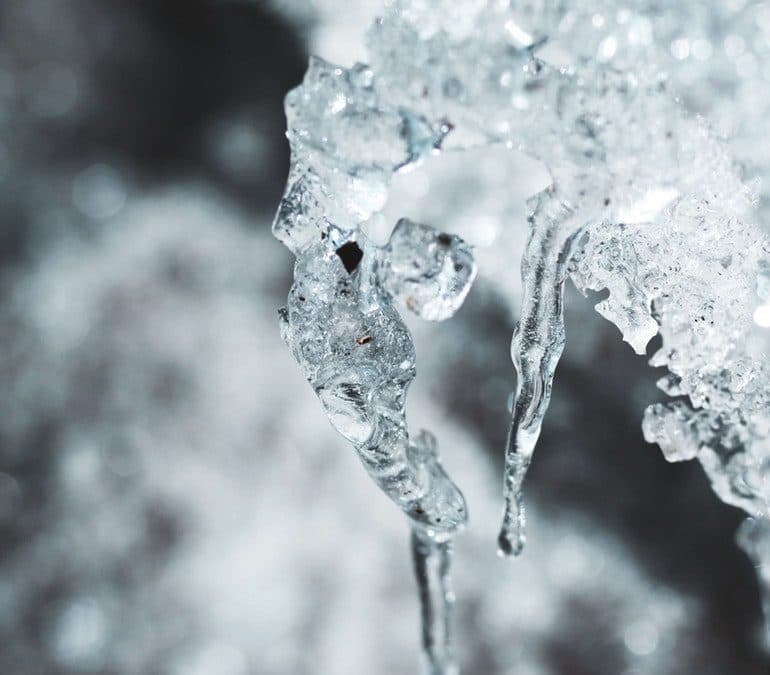 Frozen water and colder temperatures bring with them their own sets of problems for basements and foundations, such as poor ventilation and water buildup around the perimeter of the house. Temperatures typically fluctuate enough in the winter to melt and refreeze water. When snow builds up around the outside of your home then melts, the soil gets even more saturated and water makes its way into the basement. It’s also important to have a good slope away from the house prior to snow coming. When the weather warms up as spring approaches, all snow will melt, so it’s best to get any waterproofing done prior to warmer temperatures. Warm air rises, so much of the heat in your house heads for the attic area and the roof in wintertime. The roof warms, except for the eaves. When snow falls on the roof, it encounters the warmer temperature and starts to melt at that point of contact. The water then heads for the eaves and gutters, which are not warmer, and freezes. The ice adds up and becomes bigger, allowing water and melting snow to drip under the roof shingles and along the perimeter of the house since the gutters can’t direct the flow elsewhere. There are several ways to tackle ice dams, such as using a snow rake to keep the roof clear of snow or setting up a system of heating coils. Never hack at the ice as that will damage your roof, eaves, or gutters. There also are more permanent ways to prevent water from freezing in the first place, such as better insulating the attic’s floor and installing vents. You might think frozen pipes aren’t a big deal. The water just stays in there and freezes until it melts in the spring, right? Not quite. When water freezes, it expands, potentially cracking the pipes. Anything that isn’t frozen and still is flowing will flow right out into your basement, causing flooding. Proper pipe insulation will help keep pipes from freezing. Frost heaves occur when temperatures fluctuate, causing water in the soil to alternately freeze and thaw. Frozen water expands and presses the soil against foundation walls, which can cause cracks and moisture seepage into the basement. When the foundation has soil frozen to it and frost-heave pressure is applied, “adfreezing” happens. Adfreezing can result in vertical shifting. Signs that indicate waterproofing issues with your foundation include sagging doorways and floors; windows and doors that have gaps; windows that crack; doors that stick or won’t latch; or there are cracks or bowing in the basement walls. Since Mother Nature is not going to back off her yearly schedule, it’s up to homeowners to deal with winter’s aftermath. In addition to hiring professionals to address your winter foundation problems, there are preventive measures you may take. Keep the basement and foundation as waterproof as possible. Provide adequate ventilation and, if necessary, run dehumidifiers. Seal any wall or foundation cracks, and install a vapor barrier. Insulate the attic floor and seal any cracks up there. Install soffit and ridge vents, too. Make sure landscaping slopes away from the house at an appropriate angle so water drains away from the foundation.